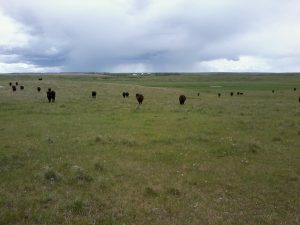 Friday I spent most of the morning checking cattle. I drive through each herd once or twice a week; I'm looking for sick or injured animals, broken fences, strays, or anything else out of place. I also check their water sources and mineral tub. 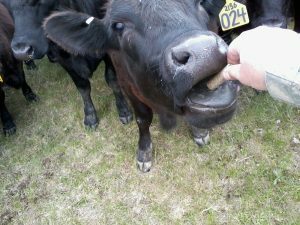 We supplement the cattle with the minerals they need which are not supplied by the grass. I've been trying harder lately to enjoy my job. Not that it is difficult, but sometimes I take for granted some of the perks of my occupation. One of the things I love about South Dakota is watching the sky. Today there were scattered showers in the area and I could watch them develop and move across the sky. On days like this, watching the sky can be a better forecast than watching the TV. These yearling heifers heard me calling and are coming to get their cake. I kinda feel like the Pied Piper leading the snakes out of Ireland sometimes. Cake is the equivalent to a doggy treat for cattle. When I show up in the pasture, I call "Come girls!" and they come running, knowing I've got something good in the bucket. 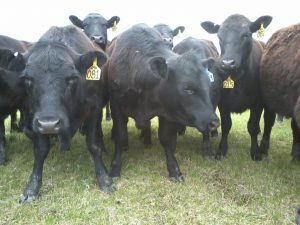 It makes an easy job out of moving the herd to a new pasture, or bringing the herd into the corral to treat sick ones. There's always a few that push their way to the front. 024 looks like she's going to be the "pig" of this herd for the summer! She ate about a dozen pieces of cake out of my hand before I left. 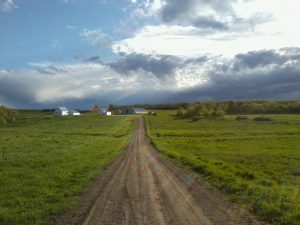 I got home well before the rain started. It's been a wet spring so far, but not as wet as many other places in the state. Our hay crop and grass have a great start to the year. 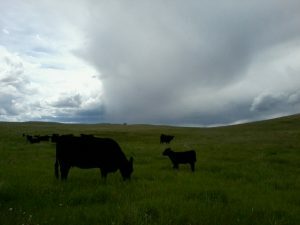 I'm going to try to post every now and then a little about what's been going on around the ranch. If you ever have questions about something you see, please ask! I'd be happy to explain! 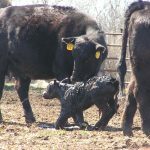 A first-time mother cares for her newborn calf. One of our most productive “employees”. 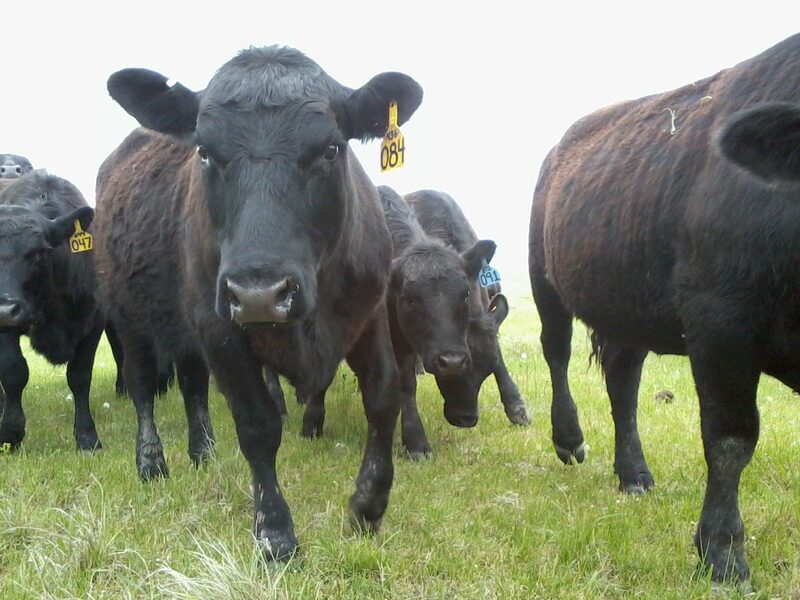 We have roughly 400 Black Angus mother cows that punch the clock every day, raising some of the best-tasting beef you'll ever eat. 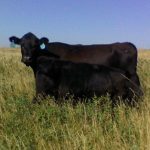 They do a wonderful job of converting grass into protein. We also raise our own replacement females.